Amb. 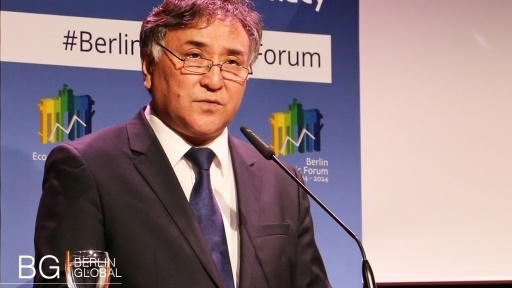 Erines Otorbaev has been the Ambassador of the Kyrgyz Republic to Germany since June 2015. Amb. Erines Otorbaev has an MSc degree in Foreign Languages from Kyrgyz State University. From 1990-1992 he was the Executive Secretary for United Nations Association of Kyrgyzstan. In 1995, Amb. Otorbaev Erines became a Counsellor for the Embassy of the Kyrgyz Republic to Germany. In addition, Amb. Erines Otorbaev speaks 5 languages - Kyrgyz, Russian, German, Polish and English. The beginning of intensive cooperation between the two countries was on the 4th of July 1992, just one year after the declaration of independence of Kyrgyzstan. In the same year, a German diplomatic mission was opened in Kyrgyzstan. Germany is Kyrgyzstan’s main partner in the EU and the only European country which has a fully-fledge embassy in Kyrgyzstan. Currently it is estimated that there are around 8000 native Germans living in Kyrgyzstan. This link has formed a significant aspect of bilateral relations between Germany and Kyrgyzstan. Anyway the importance of bilateral political relations has not so far been reflected in the economic relations between the two countries. In the field of development, there were confirmed two priority areas of bilateral development cooperation – sustainable economic development and health care reform. To achieve these objectives, the focus should take into account potential areas of social conflict, by promoting youth and structurally weak regions. Financial Cooperation focuses on two areas: helping Kyrgyzstan to implement its national health care reform programme in several international donors and enlarging the microfinance sector, especially in rural areas. The aggregate amount of bilateral technical and Financial Cooperation runs nearly EUR 300 million, making Germany the third largest bilateral donor after Japan and the US.